In 1961, Jack Handyside Barnes, his nine year-old son, and a local surf lifesaver were rushed to Cairns Base Hospital after developing Irukandji syndrome. Thus the riddle of what caused Irukandji Syndrome was solved; years of detective work had reached its climax in a dramatic and decisive episode of self-experimentation. Jack Barnes was both a medical doctor and a former military commando. He was Medical Superintendent on Thursday Island in the Torres Straits from 1947, and from 1953 he worked as a general practitioner in Cairns. From 1945 onwards he was at the forefront of ongoing explorations in the burgeoning field of marine envenoming. 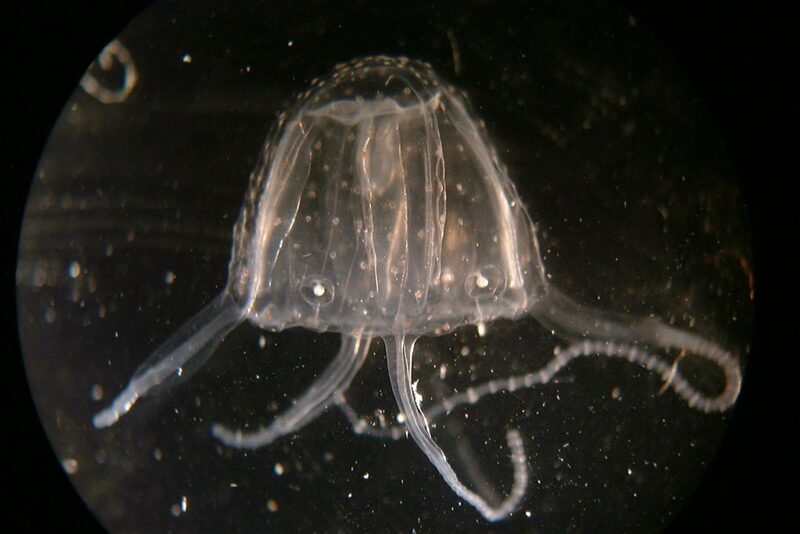 Today, Barnes’ reputation is founded upon his discovery that a thumbnail-sized, nearly invisible, carybdeid (or four-tentacled box jellyfish) could cause Irukandji syndrome. Southcott equated this Irukandji syndrome with what he termed “Type A Stinging”, a distinct entity to “Type B Stinging” which we now know to be caused by the larger multi-tentacled box jellyfish, Chironex fleckeri. Despite ongoing efforts the identity of the causative agent of Irukandji syndrome eluded both Flecker and Southcott, even in the face of drastic measures such as sieving the sea-water of the Cairns City Baths. After the death of Flecker in 1957, Barnes was appointed to continue Flecker’s marine investigations. Suspecting that jellyfish were culpable, Barnes tried to retrieve nematocysts from the sting sites of Irukandji victims. He was only able to collect “an assortment of harmless contaminants”. 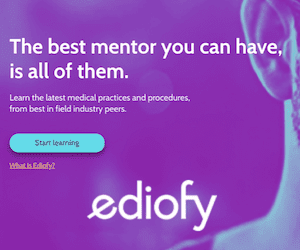 Indeed, even today the low yield of nematocysts from skin scrapings and sticky-tape sampling of sting sites continues to dog investigators of Irukandji syndrome. 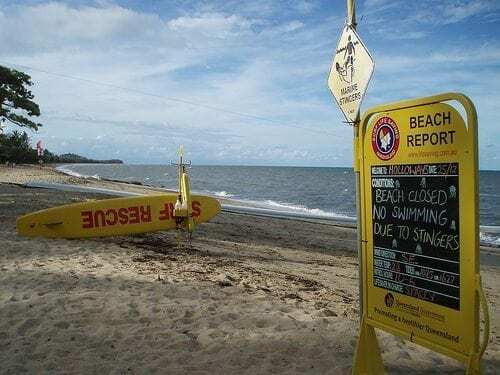 By logging records of marine stingings, from the Queensland Ambulance Transport Brigade and Cairns Base Hospital, Barnes was able to define the modus operandi of the as-yet-unknown offender. Stings occurred in December and January, with 85% of stings located on the contiguous Palm and Ellis beaches. Barnes realized that this was due to a marked change in the usual northward currents driven by south-easterly winds that are predominant in the Cairns area for most of the year. The stings were most numerous when winds blew steadily from the north, driving currents onshore. However, trying to identify candidate jellyfish at this time of year was impossible due to an “embarrassment of riches” in marine life – the fine-mesh nets Barnes tried to use clogged up with countless species of jellied life-forms in a matter of minutes. Barnes’ detective work allowed him to make a few key deductions, leading him closer to his evasive prey. He deduced that the causative agent must be small, because victims were often only partially submerged in sea water or splashed by small wavelets washing over exposed skin, and would probably be found in surface water. It must also be colourless and transparent because no one could see the damned thing! And because stings tend to occur in “bursts”, when present the culprit species was likely to be found in large numbers. Finally the tiny beast must be mobile, because a likely causative agent had never been found stranded onshore. Barnes realized that the best way to find such an elusive organism would be by capturing it underwater, using oblique light to render the tiny creature visible when looked upon through a diver’s face-mask. On 10 December 1961, soon after the report of cases of Irukandji syndrome from the same area, Barnes and his helpers identified two specimens of a candidate species of jellyfish. Barnes was only able to see the body of the first specimen when he’d brought it into contact with the glass of his face-mask. The second specimen was captured by life-saver Don Ludbey, who only noticed the jellyfish because it was attached by a single tentacle to an erratically swimming fish! At this point, Barnes still needed conclusive proof that the organism he’d found could cause Irukandji Syndrome. He decided to perform an experiment that would challenge even John Hunter’s auto-inoculation with venereal disease for sheer bravado. The first Carybdeid was applied to an adult (J.B.), and to a boy, aged nine years (N.B.). A robust young life-saver (C.R.) volunteered to test the second specimen, of similar size to the first. – Barnes, 1964. I can only assume that with Christmas looming on the horizon, young “N.B.” must have negotiated an impressive wish list of presents before allowing his father to imperil his young life! The lad reported mild abdominal pain twelve minutes after being stung… As systemic effects became manifest, subjects were seized with a remarkable restlessness, and were in constant movement, stamping about aimlessly winging their arms, flexing and extending their bodies, and generally twisting and writhing… … muscle groups in tonic contraction, little short of spasm… and the volunteers adopted a stance which I can best liken to that of an infant with a full nappy… All had abdominal and back pain, pain in the anterior chest wall with some difficulty in breathing, and diffuse aches in muscles and joints……it was agreed that movement did not relieve symptoms, nor did pressure and rubbing… Forty minutes after the stinging, the abdominal musculature of the three subjects was in unrelenting spasm, so rigid as to warrant fully the term “board-like”. Vomiting… was not troublesome for some forty minutes. The adults obtained complete relief two minutes after the injection of 50 mg pethidine… Symptoms began to return 20 minutes after… As the effect of the second injection wore off, all subjects complained of neuralgic pains… and intermittent administration of aspirin was necessary for approximately 24 hours. Thereafter no ill-effects were apparent. – Barnes, 1964. A full description of this malevolent little creature was published by Southcott in 1956. Southcott named the carybdeid jellyfish Carukia barnesi in honour of the intrepid Jack Barnes, with the generic name compounded from Carydea and Irukandji. As well as identifying Carukia barnesi as a cause of Irukandji syndrome, Jack Barnes also identified the use of opioids as a useful treatment, proposed that other jellyfish may also cause “pseudo-Irukandji” syndromes, and instigated public health measures such as warning posters to educate the public. However, not even the impressive Dr. Barnes was always right – his advice to treat stings with methylated spirits should be disregarded; use vinegar instead! Barnes JH. Cause and Effect in Irukandji Stingings. Med J Aust. 1964 Jun 13;1:897-904. Flecker, H (1945). Injuries by unknown agents to bathers in North Queensland. Med J Aust, 1:98-. Flecker H. Irukandji sting to North Queensland bathers without production of weals but with severe general symptoms. Med J Aust. 1952 Jul 19;2(3):89-91. Flecker H. Fatal stings to North Queensland bathers. Med J Aust. 1952 Jan 12;1(2):35-8. Southcott RV. Studies on Australian Cubomedusae, Including a New Genus and Species Apparently Harmful to Man. Australian Journal of Marine and Freshwater Research 1956;7(2): 254-280. Sutherland SK, Tibballs J (2001). Australian animal toxins: the creatures, their toxins and care of the poisoned patient. Melbourne, Oxford University Press.